In the three years since its publication. 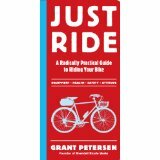 Grant Petersen’s Just Ride has become something of a bible for a certain type of cyclist – a type that Petersen himself dubs the ‘unracer’. I’m not all that happy with that term because it still defines such people – ie, us – in reference to racing, and as a negative. Frankly, I’d rather just ignore racing altogether and talk about recreational cycling. Maybe Petersen would prefer to do the same: but he’s an ex-racer in much the same way, I suspect, that some people are ex-addicts. And so he references racing constantly throughout this book. But there is a good reason for that. Petersen’s thesis is that racing has had a malign influence on cycling. The equipment we use and the attitudes we adopt as cyclists have all been distorted by the constant demand for high performance and competitiveness. Many of these attitudes even leech through into non-racing activities, such as road touring. In some ways, I think events have overtaken this book. For example, the rise in popularity of Dutch-style bikes, e-bikes and the use of bicycles for commuting has acted as something of an antidote to the narrow obsessions of racers. There was a time when you would have looked in vain for panniers and clothing and other accessories that cared as much about style as they do about function. And yet, when we walk into our local bike stores, here in France, you will still struggle to find helmets (to take one example) that aren’t those silly aerodynamic, cutaway types that make you look like a cheap Hasbro version of the alien from Alien. I mean, seriously … I’m a 58 year-old arthritic couch potato who’s going to be riding a Dutch e-bike along a greenway. How much less effort will I need to make because my hat is streamlined? So, if you’re tired of all the racing/fitness/performance nonsense and just want to ride a bike for fun or as personal transport, Just Ride will not only provide you with moral support, it also explodes many of the myths that originated with the racing brigade – for example, the idea that you need to have your feet clipped or strapped to the pedals so that you can power on the upstroke as well as the downstroke. If you want to mash, then go ahead and mash, and if people want to criticise you for that, it only shows how petty and misguided they are. If this makes Just Ride sound like nothing more than a polemic, then I’ve done it an injustice, because it’s also packed with useful, practical information about topics such as ensuring you have the right bike, choosing suitable clothing (mostly, what you’re already wearing), cleaning the bike (mostly, don’t) and health (not fitness). The chapters in the book are all very short – mostly around a page in length. In all likelihood they started life as blog posts. At the beginning of the book, Petersen warns that you probably won’t agree with everything he says – and I didn’t. I’m unconvinced by the arguments against blinky lights (speaking as an aviator; on aircraft, flashing lights are the primary method of achieving conspicuity). And he calls gloves the least necessary accessory, but they were the first thing I bought because of the arthritis in my hands. I’ve picked out that relatively trivial example because it highlights the fact that cycling is a personal thing – what suits or is important to one person may be inconsequential to the next. And that, really, is the the overarching message of the book, reflected in the title. There’s really no wrong way to ride a bike unless you’re being positively dangerous. We all have different ideas about what we want to get out of cycling, and they are all equally valid. Just Ride encourages that kind of thinking and is, in that way, inspirational. I enjoyed the book and will read it again soon, but I don’t agree with everything in it either. For instance, I’m guessing that Petersen has been cycling pretty much all his life and has tough sit bones, but for me, coming back to cycling for the first time in about 30 years, finding proper cycling tights with a great chamois has been a total lifesaver. I’m a recreational swimmer and in the pool I wear as good a swimming costume as I could find – not to go faster because I couldn’t care less, but to not exhaust or hamper myself needlessly. I feel the same about the cycling clothes I’ve bought and I’m aware, even on a stationary bike, of how much more comfortable it is to have a close-fitting tight rather than a flappy pair of trousers. As to his obsession (albeit negative) about racing, the effect that racing has had on biking has entirely passed me by. I’m not generally interested in sport and would struggle to name any cyclist other than Lance Armstrong (for all the wrong reasons). I had no idea that bikes were sold without mudguards (fenders), for instance, or without saddles, and since the Dutch trend has now overtaken commuting, I feel very comfortable with the options on offer online and in the shops. So, in that instance, I think he protests too much, though I suppose things may be different in America.